Neuroscience tells us that the products of the mind--thought, emotions, artistic creation--are the result of the interactions of the biological brain with our senses and the physical world: in short, that thinking and learning are the products of a biological process. This realization, that learning actually alters the brain by changing the number and strength of synapses, offers a powerful foundation for rethinking teaching practice and one's philosophy of teaching. James Zull invites teachers in higher education or any other setting to accompany him in his exploration of what scientists can tell us about the brain and to discover how this knowledge can influence the practice of teaching. He describes the brain in clear non-technical language and an engaging conversational tone, highlighting its functions and parts and how they interact, and always relating them to the real world of the classroom and his own evolution as a teacher. "The Art of Changing the Brain" is grounded in the practicalities and challenges of creating effective opportunities for deep and lasting learning, and of dealing with students as unique learners. "[The] conclusions Dr. Zull draws with respect to effective teaching and learning are sound. Readers with a background in neuroscience may be particularly intrigued by the application of common neurobiological principles to the practice of teaching and learning. In spite of the complexities of brain biology and teaching/learning theories, Dr. Zull presents a clear and accessible discussion. The text is enhanced by numerous case examples of teaching and learning situations both from Dr. Zull's experience and those of other teachers he has counseled. The Art of Changing the Brain is engaging and logically organized, providing readers with practical suggestions for applying the concepts in the classroom and other learning situations. The final chapters, in particular, reflect more deeply on the nature of teaching and learning activities that have the greatest potential to result in functional changes in neural connections. Readers will feel encouraged and eager to integrate the concepts into their own philosophy of teaching and learning." "The book is not merely an explication but a thoughtfully crafted, neuroscientfically informed teaching device that obeys the advice offered." "Don't expect a comprehensive book on brain research. Although there are plenty of sources cited and summarized, this is principally a book on teaching. On one hand it validates much of what teachere intuitively discovers as they grow in experience. On the other, it provides a theoretical underpinning for these intuitive discoveries. And it does this while demystifying the complexities of brain biology and teaching/learning theories by way of a clear writer's voice." "James Zull's crystal-clear mapping of how learning occurs, how learning changes the brain, and how many parts of the brain are activated as one learns should be interesting for all who teach. With simple diagrams of the physical structures of the brain, this is a wonderful synthesis of what is known about the brain and what is known about learning. The author's insightful and humorous sharing of his won learning and teaching experiences illuminates the 'art' of teaching--what happens when one tries to recognized signals from students that allow the teacher to know where and how to connect a new piece of learning…Zull relays a teaching approach and the neuroscience behind that approach that can dramatically affect learning." "The Art of Changing the Brain is teaching. Zull (biochemistry and biology, Case Western Reserve University) argues that educators can use knowledge about the brain to enhance pedagogical techniques. He does an excellent job of demonstrating his thesis by describing good approaches: e.g., increasing reception of information by enhancing the sensory aspects of teaching materials; taking advantage of integrative mechanisms by allowing time for reflection; maximizing the adaptive functions of the brain by challenging students to be creative; using action areas of the brain by providing activities to confirm and extend learning....Zull's years of experience as both professor of biology and director of a university teaching institute are apparent; the book is well written and appropriately technical for the audience interested in applying current knowledge about the brain to learning and instructing. Highly recommended." "It is clear by now, that I found Zull's book meaningful, clear, useful in many ways, and a wonderful explication of complex issues. I will sound its praises to anyone interested. I will use it with a faculty "book club" next semester. I recommend it as a necessary part of any collection of important literature on teaching and learning. And I will incorporate its lucidity and depth into my own thinking, teaching, and wonder at the marvels of the human brain and the way that we use it in our classrooms and hopefully, in the rest of our lives." "I read (devoured) this book three times, and I am overwhelmed by it. It is just perfectly and brilliantly thought through! The reader receives important information in small and easily digestible portions. The illustrations from the author's own teaching experience underscore the points he makes in a profound way." "This is the best book I have read about the brain and learning. Zull takes us on a fascinating and vivid tour of the brain, revealing the intricate structure of the organ designed by evolution to learn from experience. Using wonderful stories from his own experience, filled with insight, humor, and occasional twinges of pain, this wise and humane educator and scientist describes his concept that teaching is the art of changing the brain. His perspective forms the foundation for a teaching approach that can dramatically improve human learning." "Writing for all educators, [Zull's] theme is that a better understanding of brain function will promote a more flexible and varied approach to learning. The results offer a refreshing clarity. [In] his fine book...Zull has done a remarkable job of simplifying both brain function and learning processes. It is a synthesis of what we know about the brain and about learning, a synthesis that simplifies both fields to draw a usable map of the terrain of learning. I encourage educators at all levels to grapple with Zull's model...and integrate his insights with their own experience and understanding of the learning process. A work like The Art of Changing the Brain has long been needed." "I found The Art of Changing the Brain to be deeply thought provoking. It is not only grounded in emerging brain research but relates such research directly to the experiences of students and challenges of classroom teaching. As a Middle School Administrator, I believe that this book will become an excellent and unique resource for the ongoing professional growth of educators. The book can be profitably read by any teacher at any level, and I intend to use it in my own courses for students in education classes." "I love this book. It is refreshing because it takes a leap into the meaning of brain research for educators (sometimes precisely and sometimes a bit vague, but a leap! We have been waiting for such a book to comfortably combine the science with the practice. I hope to use it for a seminar with my own students." 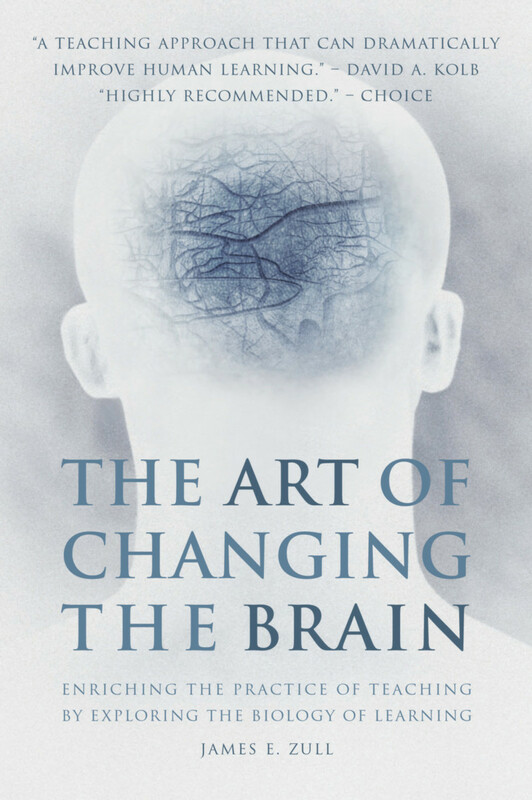 "I have just discovered your amazing book, The Art of Changing the Brain. I found it among the new books and materials, just before winter break, and read it every day now--though I am only at Chapter 6. I find I reread, and make so many connections as I go, and I do not wish to rush! " James E. Zull is Professor of Biology and of Biochemistry, and Director of The University Center for Innovation in Teaching and Education (UCITE) at Case Western Reserve University. After 25 years of research on cell-cell communication, protein folding, cell membranes, and biosensors, he turned his interest toward understanding how brain research can inform teaching. Building on his background in cell-cell communication, his experience with human learning and teaching at UCITE, and drawing on the increasing knowledge about the human brain, led to writing his acclaimed first book, The Art of Changing the Brain.